Accomodation in comfortable mobile homes located in a quiet camp site overlooking the natural reservoir. Mobile homes are suitable for recreation from May to September (except the heating season). Mobile homes are available in 2 variants - for 4 people, - for 6 people. The house has 2 separate bedrooms - one bedroom with a double bed and the other with two single beds, living room with sofa bed, kitchenette with fridge, cooker, electric kettle and basic kitchen equipment (glasses, cups, plates, cutlery), shower and toilet and outdoor terracee with seating. The total capacity of mobile homes is 14 people. There are 2 mobile homes for 4 people and 1 mobile home for 6 people. 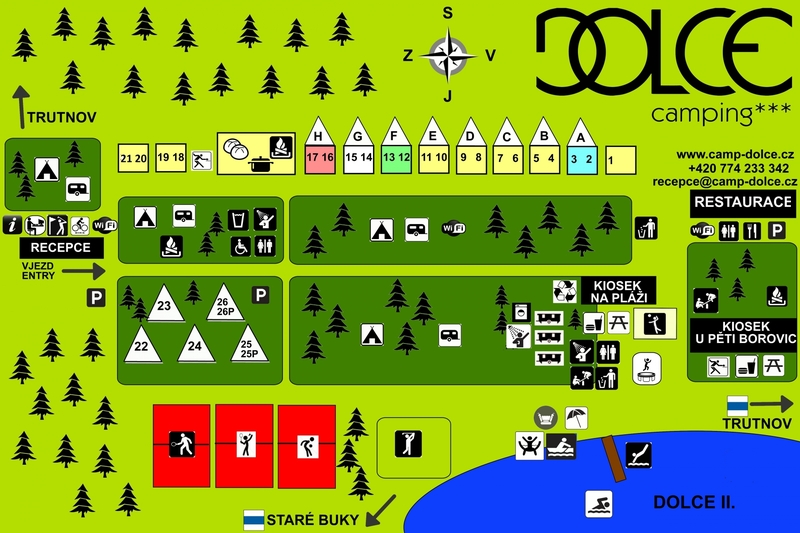 Plan of recreation area including mobile homes to download here. Caravan is fully equipped and provides a high standard of accommodation. Due to great interest we prefer recreation orders staying the whole week (7 nights). The caravan is located in the central part of the area in a strategic shady spot. In there caravan there are possible 4 beds, you will find a lounge with table and sofa, kitchen and bathroom facilities. Part of the caravan is outdoor seating (not yet in the photo).